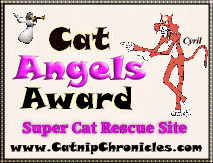 Saved Whiskers Rescue Organization, Inc. is a 501(c)3 registered non-profit animal welfare organization. Thank you for visiting Saved Whiskers Rescue Organization, Inc. Be sure to check back often to find a kitty to fall in love with and adopt! As with any charity, S.W.R.O. is dependent on the generous donations from you, the public. Please take some time to make a donation...any amount will help ensure the long term success of S.W.R.O. 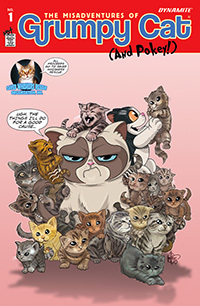 All proceeds go to Saved Whiskers Rescue! 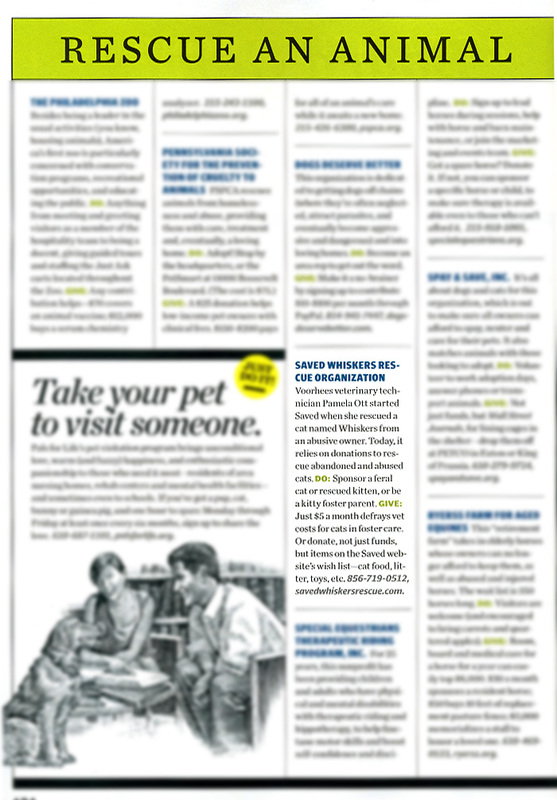 Saved Whiskers Featured Philadelphia Magazine. Click Here to See! To enter our mailing list, please fill in the form below. S.W.R.O. 's Mailbag contains articles, letters and issues in regard to animals. CHERRY HILL -- Sprinkles is down to eight lives. After a harrowing, five-month absence, the orange-and-white cat that broke loose from his leash at a New Jersey Turnpike rest stop over the summer was reunited Wednesday night with his owner and her tearful children. "It was just a dream came true," said Sprinkles’ owner, Laura Lopez. "But I never gave up hope." Since their unexpected separation, the feline that made a beeline from the Walt Whitman Service Area in Cherry Hill on July 18 soon found company with a band of fellow stray cats. The tabby had been traveling with Laura Lopez during their move from New York to Florida, but took an unplanned detour off the Turnpike, one of the most heavily traveled highways in America. "He saw all the cars and hoopla and he got scared, because he was only a baby," Lopez said of the cat that was about a year old at the time. A panicked Lopez scoured the area all day, along with police and firefighters. But the skittish Sprinkles was nowhere to be found. To See Her Story, Click Here! If you are interested in adopting this kitty, click here, or visit the other cats we currently have available for adoption. Copyright © 2003-2015 Saved Whiskers Rescue Organization, Inc. & Logo™, All Rights Reserved.